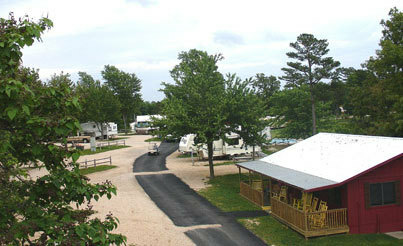 Voted as the #1 RV Park in Arkansas by Reader's Digest! When you visit Wanderlust RV Park, you're staying in the best of company. We'll help you to your campsite when you arrive, and that's just the beginning of the friendly service you'll receive.We offer 90 full hookup sites, 57 pull-thrus, and 62 sites with 50 amps. You'll also find super clean restrooms, showers, and laundry facilities. 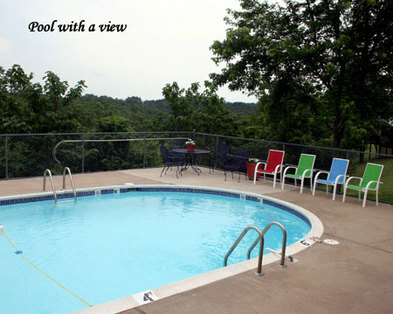 Be sure to visit our friendly RV park and cabins in Eureka Springs! NOTE: Please review your confirmation email for instructions and directions to our RV Park. GPS will not generally give you Rig friendly directions to our park unless you use a RIg friendly or trucker GPS app. So you might want to read the directions in our confirmation email. We have Big Rig Sites! Check out our Facebook site for more pictures. Eureka Springs, located in Northwest Arkansas, is a unique historic Victorian town that attracts over one million visitors each year. 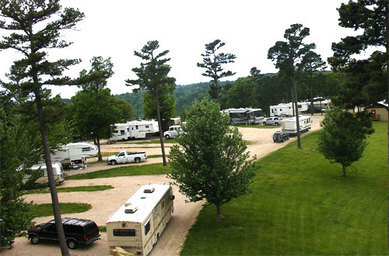 Wanderlust RV Park is just 5 minutes east of downtown Eureka Springs; one block outside the city limits. One-half mile north on Passion Play Road from Wanderlust RV is Eureka Springs’ main tourist attraction, “The Great Passion Play.” Wanderlust RV Park has a tourist trolley stop on the “Blue and Yellow Route” that provides easy access to other attractions in and around Eureka Springs. Guests appreciate the variety of local entertainment from country music shows, Victorian home tours, car rallies, bike rallies, shopping, craft fairs, antiques shops, parades, restaurants, train rides, and lots more. Wanderlust RV Park sites are located on a 46 acre tract, atop a curved, scenic ridge overlooking a deep valley. (A great place to watch majestic sunsets.) The Park itself has a pleasant, restful ambiance with its many natural trees. Flowers and shrubbery have been planted to enhance the natural beauty of the Park. Quite often deer and other wildlife make their presence known as well as a wide variety of birds. The park has over 85 full hook-up sites. Over one half of the sites are pull-thrus for those of you needing big rig sites. Picnic tables offer outside enjoyment of food and drinks with friends. There’s nothing better than a little splash in our pool for a refreshing break from those warm summer days. Rinse off in our squeaky, clean shower house. Cleanliness is one of our top priorities here at Wanderlust. For those of you needing to do a little light web-searching or have the need to check those e-mails…we have WI-FI available to you at your RV site. If you are coming to Eureka Springs without an RV, you need to check out our Hide-a-Way and cabins. The “Hide-a-Way”, located on the bottom floor in the front of the park, has a kitchenette with mini fridge, microwave, toaster, and coffee pot, living room with flat screen TV, 1 bedroom with queen size bed, fold out couch, and 1 roll away bed and a full bath. Relax on the covered patio and have a snack or drink while you enjoy the view of the woods in the valley. Patio also has a picnic table. Our cabins, the “Wilderness” and “Patriotic” are decorated according to their names. They both have a TV, two double beds, full bath, kitchenette which include mini fridge, toaster, microwave and coffee pot. The chairs and porch swing on the deck allow you to relax and enjoy an awesome view of the valley. Our social halls and pavilions have attracted many RV groups from all over the country. The social halls are equipped with full sized refrigerator, stove, microwave, coffee pot, tables and chairs an are for rent to RV Groups and they are usually assigned sites close to the social halls unless they want else where or already reserved. No need to start up your grill in the evening. Wanderlust fires up our stone grilling pit for your use in one or both of the pavilions upon request. Nothing better than hot, grilled food!! We also have a propane grill in both pavilions. We invite you to share our park with us. Our goal is to make Wanderlust the place where friends gather and lifetime memories are made.